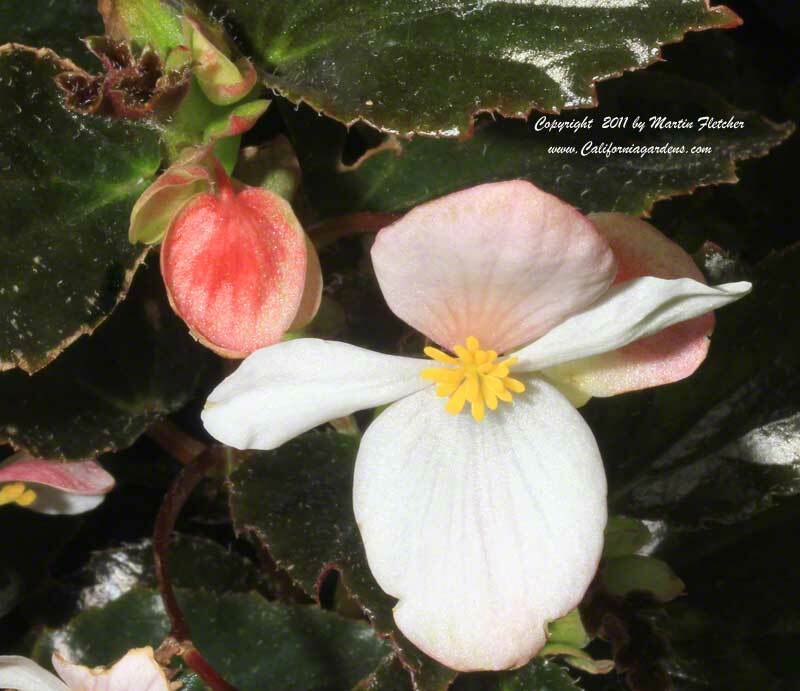 Begonia acutifolia is a near constant bloomer. The White Begonia Richmondensis stands out nicely in a shaded garden with the white flowers contrasting strongly against the dark reddish foliage. Compared to Begonia richmondensis, Begonia acuminata stays a little more compact and the stems are more weeping. The foliage of Begonia acuminata is red below and a red-green above, sometimes almost appearing black. Begonia acuminata grows 1-2 feet tall and wide. The White Begonia Richmondensis prefers regular water, but does poorly in soggy conditions. Begonia acutifolia is damaged by light frost and severely damaged at 25° F.
Flowers and foliage of Begonia acutifolia the White Begonia richmondensis. High resolution photos are part of our garden image collection.